Eric is a third generation Chicago area resident and lifelong Chicago enthusiast. He has been working in real estate analysis and related fields for nearly 20 years and loves serving clients whether they are looking to buy or rent, or sell or lease. 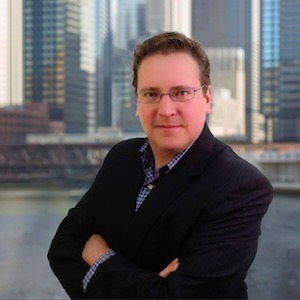 While Eric has helped clients from Hyde Park to Oak Park to Rogers Park, his main areas of expertise are downtown Chicago and surrounding neighborhoods including the South Loop, West Loop, River North, Streeterville, New Eastside, and the Gold Coast. As a resident of the Parkshore Condominiums on the lakefront, Eric loves running and bicycling in Chicago, participating in running events such as the Chicago Marathon. He also attends as many Chicago downtown and neighborhood festivals as his schedule allows throughout the year. Eric frequently works with investors including overseas landlords and helps with income property analysis, along with property management. Eric earned an MBA from the University of Chicago Booth School of Business in 2005 and has applied his knowledge to the business of real estate for many years. Eric is excited to continue serving real estate clients with the highest professionalism, honesty, and attentiveness to the unique needs of every client.